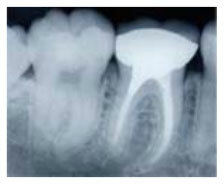 Prior to commencing endodontic treatment, all decay needs to be removed and the tooth stabilized. This may involve removing all the old fillings and placing a stainless steel band around the tooth. The tooth is also assessed for its suitability for long term restoration. A sheet of rubber (rubber dam) is placed around the tooth to isolate it from the rest of the mouth. Access is made through the biting surface of the tooth to the canals. The canals are measured then cleaned and shaped with hand files and rotary NiTi files. Finally, a sedative dressing is placed and the tooth is sealed. At the next visit rubber dam is again placed and the dressing is flushed out. 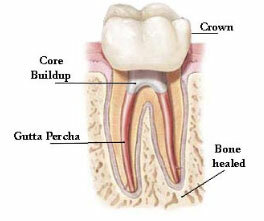 If suitable the canals are filled with a rubber like material called gutta percha. The tooth is then sealed. Further appointments may be required to place the definitive restoration on the tooth. The endodontic treatment is performed with the tooth anaesthetized like when a filling is done so there should be no sensation. has had significant loss of tooth structure and so it is weakened. To decrease the risk of the tooth fracturing or splitting your dentist is likely to recommend that a crown is placed on the tooth. The crown acts as a ring around the tooth to help hold it all together. Occasionally a tooth may have darkened before or after endodontic therapy and it may be appropriate to bleach some of this stain from the tooth. – Complex root and canal anatomy may necessitate referral to a specialist endodontist for root canal therapy. This is more likely with molar teeth. – Infection. Whilst every effort is made to treat the infection occasionally the canal system will become re-infected and require retreatment or removal of the tooth. – Fractured or separated instruments. Endodontic instruments are made to the highest standard but they are very fine and so there is the uncommon risk of the instrument fracturing in the canal. In many cases this does not affect the final outcome but it could mean loss of the tooth. – Weakness and fracturing of the tooth. Root filled teeth may not be as strong as other teeth particularly if they have extensive fillings. There is a risk of the tooth fracturing and so a crown is usually recommended following root canal therapy to reduce the risk of the tooth collapsing. – Discoloration of the tooth may occur before or after root canal treatment. This may be corrected on an anterior tooth with bleaching or placement of a veneer or crown.